Join us at Stomping Ground for an evening of sketch comedy brought to you by the talented writers of DFW. 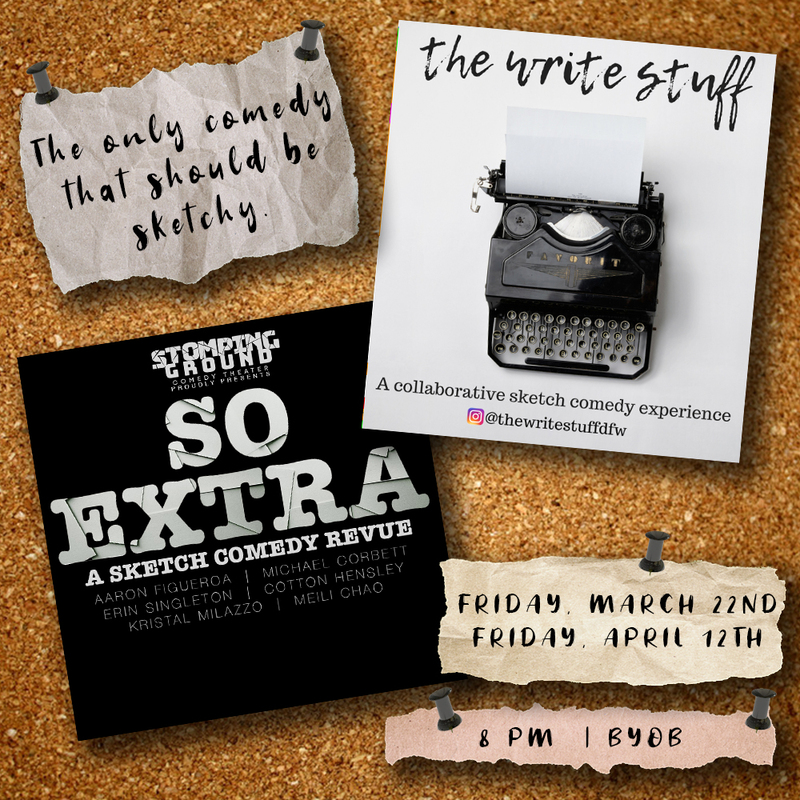 The Write Stuff is a collaborative sketch comedy experience that brings together some of the best writers and performers in Dallas. In their current sketch revue they explore the funny and the fine line between love and hate. Written by Emily Ball, Brent Crable, Aaron Figueroa, Colin Jamerson, and Lauren Levine; performed by Todd Anderton, John Baker, Bonnie Criss, Melanie Gotz, Jay Jacoby, and Sophia Kwong Myers. So Extra is Stomping Ground’s sketch comedy revue comprised of pieces snatched from the cutting room floor and brought back to the stage to dazzle audiences. From Alexa to Kon Mari Method, this revue explores our current absurd reality through songs and scenes. Written by Michael Corbett, Aaron Figueroa, Erin Singleton, Kristal Milazzo, and Meili Chao and performed by Rashid Eldoma, Javoris James, Collin Brown, Kat Lozano, Jessica Roth, and Katie Dallas. Directed by Lindsay Goldapp.